Sir Ranulph Fiennes is recognised as ‘The World’s Greatest Living Explorer‘. Ranulph Fiennes was born in 1944 and educated at Eton College. He served with the Royal Scots Greys before joining the SAS. In 1968 he joined the army of the Sultan of Oman and was later awarded the Sultan’s Bravery Medal by HM the Queen. Having led 22 major expeditions to remote parts of the world, including both Poles, Ranulph Fiennes is the only man alive to have travelled around the Earth’s circumpolar surface. He was the first explorer to completely cross the Antarctic continent unsupported, and in 2009, aged 65, climbed to the summit of Mount Everest becoming the oldest Briton ever to do so. Since 1969, when he led the British Expedition on the White Nile, Ranulph Fiennes has been at the forefront of many ground breaking exploratory expeditions. Transglobe (1979/82) – The first surface journey around the world’s polar axis during which Sir Ranulph Fiennes and Charles Burton became the first people ever to reach both Poles by surface travel. North Polar Unsupported Expedition (1986) – The furthest north unsupported record. Anglo Soviet North Pole Expedition (1990/91). Ubar Expedition (1991) – Discovered Ptolemy’s long-lost Atlantis of the Sands – the frankincense centre of the world. Pentland South Pole Expedition (1992/93) – The first unsupported crossing of the Antarctic Continent and the longest unsupported polar journey in history. 7x7x7 (2003) – Ranulph Fiennes, with Dr. Mike Stroud, ran 7 marathons, in 7 days, on 7 continents. The challenge was completed despite Sir Ranulph suffering a major heart attack and double bypass operation just four months prior. The Eiger (2007) Sir Ranulph climbed the North Face of the Eiger raising over £1.71 million for Marie Curie Cancer Care. 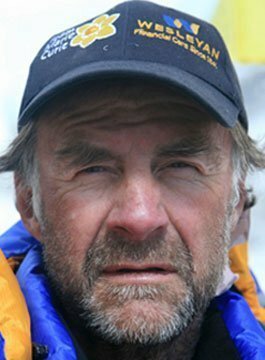 Everest (2009) – Sir Ranulph conquered Everest (aged 65) raising funds for Marie Curie Cancer Care. The Coldest Journey (2013) – Sir Ranulph attempted to lead the first team on foot, across Antarctica, during the southern winter. He was evacuated from the Antarctic due to frostbite. In 1986 Ranulph Fiennes was awarded the Polar Medal by HM the Queen for Outstanding Service to British Polar Exploration and Research. His late wife Virginia was the first female to be awarded the Polar Medal. In 1994, he received a 2nd clasp to his Polar Medal in recognition of his outstanding achievements in Polar exploration. No-one else has a double clasp medal each of which acknowledges both Arctic and Antarctic achievements. To date, Fiennes has raised over £14.2 million for UK charities through his expeditions and in 1993 was awarded an OBE for Human Endeavour and Charitable Services. Sir Ranulph Fiennes is also a best-selling author. His first book was published in 1970, and since then he has written many best-sellers. They include his autobiography Living Dangerously, The Feather Men (which was adapted into a Hollywood movie), Atlantis of the Sands, Mind Over Matter, The Sett, Fit For Life, Beyond the Limits, The Secret Hunters, Captain Scott, Mad, Bad and Dangerous to Know, My Heroes: Extraordinary Courage, Exceptional People and Cold. In his one of most recent books FEAR, the world’s greatest explorer delves into his own experiences to try and explain what fear is, how it happens and how he’s overcome it so successfully. He examines key moments from history where fear played an important part in the outcome of a great event. He shows us how the brain perceives fear, how that manifests itself in us, and how we can transform our perceptions. As a leading Motivational Speaker, Sir Ranulph Fiennes draws an analogy between nature’s most dangerous and difficult challenges, and the very real day-to-day business challenges. Persistence, tolerance, planning skills, high organisational ability, flexibility to meet and beat unexpected obstacles, goal-setting and performing under extreme pressure are clearly all factors in the success of Sir Ranulph’s remarkable endeavours. The same qualities are all crucial to success in the business world. Nothing is Beyond Your Reach: Personal Motivation and Determination. A Commitment to Challenge: Motivation, Leadership and Teamwork. The Atlantis of the Sands: The Long Search for the Lost City of Ubar. To the Ends of the Earth: The Transglobe expedition was the first journey around the Earth’s polar axis, setting new standards for achievement. Presentations (with or without slides or video) vary in length from 30 to 75 minutes and are available as a motivational keynote or after-dinner speech. 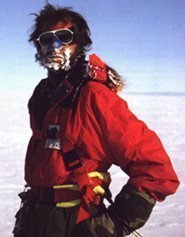 Sir Ranulph Fiennes is one of our longest represented clients. The Gordon Poole Agency have worked closely with him for over 30 years. For speaking engagements, ambassador roles, media opportunities and endorsements please contact us and speak to an agent for Sir Ranulph Fiennes.